Outdoor education supports parents and other guardians by making arts, physical activity, civics and STEM (science, technology, engineering and math) accessible to youths otherwise limited by their social circumstances. Moments spent in park settings nurtures the timeless needs of our children even as schools are transformed into test-taking factories. Gardens offer time and space to enrich all that’s gradually displaced indoors as music, art and even recess are either reduced or replaced. Replaced by what? Answer: test prep to satisfy federal policies like No Child Left Behind and Race to the Top even as our increasingly complex world requires the critical thinking and sense of personal efficacy factory environments destroy. The better elements of yesterday’s civics, shop and home economics must now advance as lively membership meetings/public events, volunteer days and cooking/canning classes. Today’s citizen ought to regard our public open spaces – from nature preserves to community gardens and nature centers – as sources of a four-season wonder. These modest places betray their potentially exalted function in society as crucibles of democracy, citizen science and heritage. 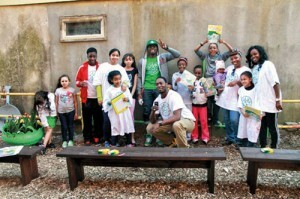 Every Garden a Library: Outdoor Education in Brooklyn appears on Page 8.